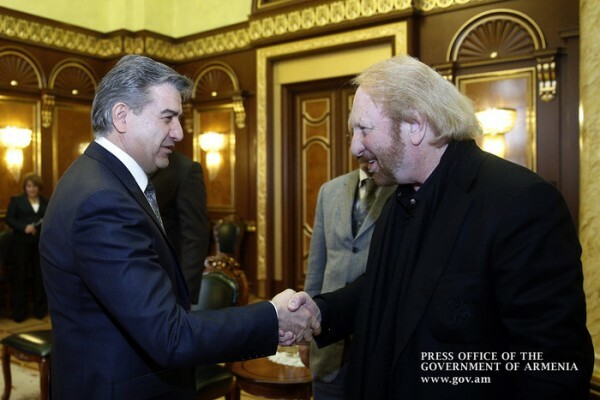 Prime Minister Karen Karapetyan received President of Associated Television International David McKenzie. The meeting discussed issues of increasing international awareness of Armenia, improving tourism opportunities and stimulating inbound tourism. David Mckenzie said that his company is going to make a documentary film about our country, with an emphasis on getting to know Armenia as the first Christian country, presenting its culture, history and the traditions of the Armenian people in a bid to help increase tourists’ interest towards Armenia. Thankful for the initiative, Prime Minister Karen Karapetyan said to be keen to enhance Armenia’s tourism attractiveness, and assured of his readiness to discuss any proposal to that effect.